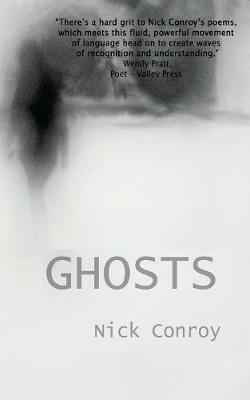 Every poem in GHOSTS touches on the theme in some way, whether it be overtly as in the title poem, or more succinctly, as in Dragonfly - in which the poet explores ephemeral elements of his perception of his mother. Nick Conroy's words touch the heart of his subject matter, and the reader's emotions at the same time, involving family, identity - and potential or actual loss. This is a strong, cohesive collection of poems, containing a hard grit which meets a fluid, powerful movement of language to create waves of recognition and understanding. The topics and themes are covered honestly, and with refreshing vulnerability in the language used. In each poem there is something of a journey - involving lostness, a seeking and in the end an acceptance of the events described. Nick Conroy's paged poetry is like the written musical score of his live performance, which has to be seen to be fully appreciated. Nick is currently studying for a Master's in English at the University of Hull. Poetry has always been at the centre of his passion as a writer, and since childhood he's enjoyed spoken word. He moved to Hull in 2014, with an understanding that the city is still revered for its poets. He senses something haunting and intoxicating about Hull, and the community of writing that it holds in high regard.